Sources from Chennai stated that ahead of the year end festivities, Malaysia Tourism has launched five packages exclusively targeting the Indian market. With a 10% discount on airfares from Chennai, Delhi, Mumbai and Kolkata, the packages assure a family friendly holiday and a broader experience of Malaysia. Meanwhile India has consistently been one of the top 10 tourist generating markets for Malaysia and has continuously made significant contributions to tourist arrivals and tourist receipts to Malaysia. As per report the country received tourist receipts of RM 1.2 billion from the India market from January till June which was an increase of 15 % for the same period of last year. Furthermore Tuan Syed Yahya Syed Othman, Director of Package Development Division, Tourism Malaysia, said these packages brought together the best of Malaysia's islands and beaches, city, gastronomy and family friendly experiences, and would provide a broader experience of Malaysia. Moreover it is aimed to promote more value for money holiday packages to Malaysia for tourists from India. Reportedly bookings are open from December 15 2018 to January 15, 2019, for travel to Malaysia between February 1 and July 31, 2019. 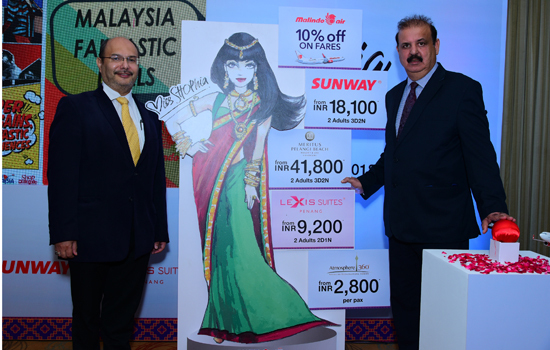 Moreover the premium Malaysia based airline, operating to nine cities in India, is offering a 10 % discount on airfares from four Indian metros.